When Starbucks revealed its new holiday cup — a simple design fading from bright red to cranberry — social media blew up with opinions. Evangelists such as Joshua Feuerstein claim that this is another symptom of the "war on Christmas," while others argue, rightly so, that this is "just a cup." It often seems as though we live in a culture of complainers. If someone says "Merry Christmas," another will be offended because they don't celebrate Christmas. If, on the other hand, someone says "Happy Holidays," another will be offended because they believe that Christianity is under attack. It's important to remember that these people are in the minority; the only reason we hear about it is because of the ridiculous stink they make. As a Christian, I couldn't care less how someone tells me to have a good season, I am just glad that they wish that for me. My roommate is Jewish, and she feels the same way when people wish her a merry Christmas. 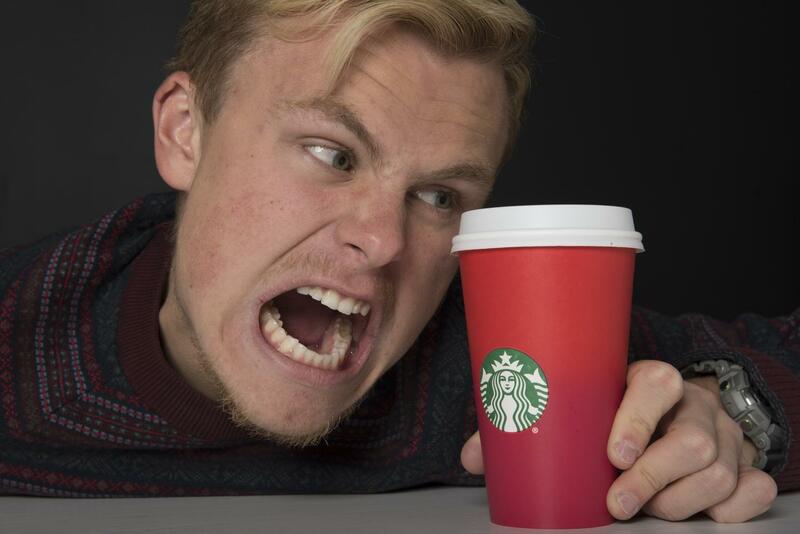 Those who are against Starbucks' new cup are in the group that believe in the "war on Christmas," or the trend of taking away Christmas-related decorations and themes in public spaces. The onslaught of reindeer, snow, evergreens and Santas on my walk through the mall last weekend seems to debunk this, but that is not the point. "In the past, we have told stories with our holiday cup designs," said Fields. "This year we wanted to usher in the holidays with a purity of design that welcomes all of our stories." The rest of the article on Starbucks' website explains how the cup was in part inspired by those who had taken to drawing on their cups. The cup imitates a blank canvas for customers to add to. Still, there are those, such as Donald Trump, who claim that this is Starbucks' attempt at being "politically correct" in a society that is obsessed with all-inclusiveness. "No more 'Merry Christmas' at Starbucks," said Trump at a rally in Illinois. He went on to suggest a possible boycott of Starbucks, mentioning that the lease for the division in Trump Towers may not be renewed. "I mean look at this cup," Degeneres explained. "You might as well call it a 'Satan Sipper.'" All jokes aside, this is a serious issue. Not because of the lack of spirit, but because of how it desensitizes our culture. When everyone is complaining about being attacked and marginalized, how do we decide which are the real issues to be dealt with? We laugh at the ridiculousness of the so-called "red cup controversy," while we ignore the real problems going on in the world. Some Christians in the United States are arguing that they are being attacked with a cup while Christians in the Middle East and Asia are murdered for their beliefs. It isn't just Christians that get persecuted either; religious groups around the world are marginalized and attacked for their beliefs. Meanwhile, people in the U.S. complain when a company tries to redesign a cup, or, even worse, actively tries to be all-inclusive. It is important to realize that Starbucks' intentions were not even to be explicitly inclusive of everyone, or to diminish their celebration of Christmas. The cups are still red with the green Starbucks' logo, traditional Christmas colors. A majority of the symbols in the past were more general winter things than Christmas things anyway; you don't hear anyone complaining that Starbucks is ruining winter, though. In truth, I think it's only a small minority that is actually bothered by the cup. Most rational people realize that the whole thing is ridiculous, but the controversy was fueled by spreading #ItsJustACup on Twitter, leading news agencies to think it a newsworthy story. There is some good fodder out there, too. Groups and people have been designing their own cups to make fun of the controversy, including a rainbow design and a blue cup with a menorah. Ironically, this was Starbucks' original intention — for customers to use the cups to create their own story. So who is the real winner of this so-called scandal? Starbucks, of course. The publicity alone is great for them. Even Feuerstein is encouraging people who are angry at the red cup to purchase coffee at Starbucks; he tells his followers to tell the barista that there name is "Merry Christmas" to "trick" them into writing it on the cup. I fail to see how this, in anyway, gets back at Starbucks, seeing as they make money off of it. There is a loser of this debate: the real people, the real issues that are getting marginalized and outright ignored.